Grannie Lindsay had two young men she was especially proud of – her “preacher boys”. 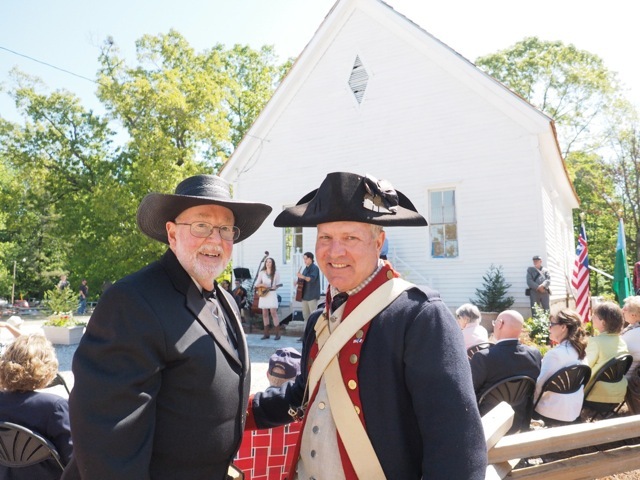 Her first preacher was also her firstborn grandchild, James W. Lindsay, ‘Jimmy’ to the family and Brother Jim to his many friends. He was almost 10 years old when Mother announced that she’d be having a baby within the year. Jimmy was well settled into his God-given role as not only the first but the favorite of the whole family of aunts, uncles, cousins and various other relatives. Grandpa was making good headway in developing him into a major-league baseball player. And Jimmy honestly declared that he didn’t care if Martha did have a girl, he would not be impressed and probably wouldn’t even bother to go see “it”. When they told Jimmy that his new little “it”, was a boy, he was more than just a little disappointed. In fact, he refused to even come see that new runt who he feared would usurp his birthright of most-favored status. When they made him come, he still gave Grannie such grief that she got a good hold on him and pulled him up into her lap. That’s about as indignant treatment as you could give a 10 year old Babe Ruth in the making. Well, that satisfied Jimmy for the time being. And in fact, it still does. He reminds me, almost 76 years later that he is Grannie’s THUMB. I just had to settle for being a little finger! And being a little finger to a woman like our Grannie Lindsay is a great enough standing to suit me. And to be on the same hand with a Thumb who is a great preacher, a man of God like Rev. Jim Lindsay is an honor that I’ll go to my grave trying to live up to! “Oh no!” she emphatically declared, with that twinkle in her eye. And then she uttered one of those bits of wisdom that we have cherished from her. YOU’LL NEVER GET OLD AS LONG AS YOU ARE CURIOUS! Thanks, Grannie, for passing along that gene to me! If I can be as healthy and in as good mind as you were for nearly 90 years, I’ll earnestly seek to “grow old gracefully”, which by the way was another of her oft declared bits of wise advice. Posted on March 25, 2016 by Dun Gordy. The old worn Broadman Hymnal that I take down quite often in quiet times ushers me back to significant places and bring those “Precious Memories” that one of the hymns sing about. Today the hymn I was trying to sing was one that brought back memories of a very plain classroom in a non-descript concrete block building. I don’t remember any decorations nor furnishings except the teacher’s desk, about 30 student’s desks and a blackboard. Yes, it was a BLACKboard in those days before the green “chalk board” was invented. That was 1957 and I was a freshman in Truett-McConnell Junior College (now University). Lots more than just the name has changed since those happy days. But one ting has not changed. The stirring in my spirit when I hear and/or try to sing for myself the words of that great old hymn. I suppose we did sing it in my church growing up but it was in the first meeting of the student “Ministerial Association” that I had come to join. It turned out to be the theme song of our small club. It has been a theme of my heart from that day until this. When I shall lay my armor by, And dwell in peace at home? We’ll work till Jesus comes, And we’ll be gathered home. There are several more very meaningful verses, written by Elizabeth K. Mills back in the 1830’s. But it is the heartbeat of the chorus, that moves my soul. I do want to work in the ministry to which our Lord called and equipped me. And that’s is no credit to my account for this sentiment and determination. I have a calling, not just a ‘career’. Mine is a passion, not a profession. Romans 11:29 declares that “…the gifts and calling of God are without repentance.” If our Lord has called you to salvation, you are still as called and secure as you were the moment you received His free gift by faith in His Son. If He has called you to the Gospel ministry, you are still called. The spiritual gift He has given you for service in His church, may have become stale and cold because of neglect and disuse. But there is no indication in the New Testament that He only equips anyone for a designated, limited time. Your spiritual gift and mine has not been and never will be subject to any man-made notion of “retirement”. I want to keep on keeping on for Jesus sake, in His service. And I want to challenge my fellow servants, let’s work till Jesus comes, and we’ll be gathered home! Posted on March 24, 2016 by Dun Gordy. I wonder if there does not come a time in every preacher’s life when he realizes that the books on his library shelves need to move? At least in my case it is move again. Some of my volumes have been boxed and crated, shipped and hauled from Georgia and Alabama, thru Pennsylvania, Oregon, Florida and now back to my native state where I began to collect this treasure. Though much of the contents of these volumes have moved into my mind and some, maybe more than I realize myself, have moved into my heart and become a very part of who I am. ​Some of the most treasured volumes in my meager library are those which were passed on to me from older preachers. A few of them had reached the stage in life and ministry that I now face. Others volumes have come from my contemporaries who knew just what I needed and had the grace and generosity to pass them to me. ​So now, it is my privileged position as a squeaky and creaky old boxcar in a train ready to deliver the cargo. But first I must complete the laborious process of sorting thru and culling out and passing on and hanging on. But what about that stack or box I will label ‘passing on’? Are there any young preachers into whose life and ministry I may invest by sharing my treasures? Who are they? Does any young preacher still read from the printed page or have all entered the electronic age of Wikipedia, Kindle, iBooks or some other poor and lifeless substitute? I confess that this task at hand is with greatly mixed emotions. There is Thanksgiving for having possessed and used these gems and jewels; I have joy for a privilege of sharing wealth; I take comfort in knowing that I have young men coming behind me who’ll love and appreciate the nuggets of gold and diamonds of beauty hidden on some dog-eared page. And yet there is a tear from my heart like that of saying goodbye to an old and dear friend. Posted on May 7, 2015 by Dun Gordy. The Hopeful Primitive Baptist Church was organized in 1825 on what was called the “American Frontier” – now Fayette County, Georgia. 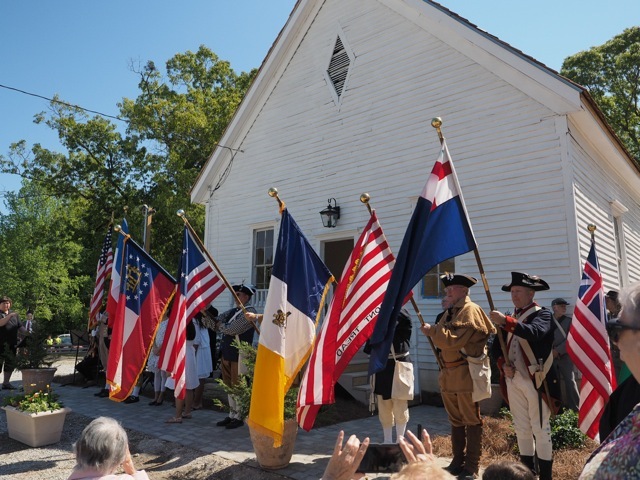 Representatives of soldiers and veterans from the American Revolution and the Army of the Confederate States of America, the government of France and many local and state dignitaries were here for the rededication ceremony of the restored old church house on May 2, 2015. REVOUTIONARY WAR SOLDIER – Col. (ret.) 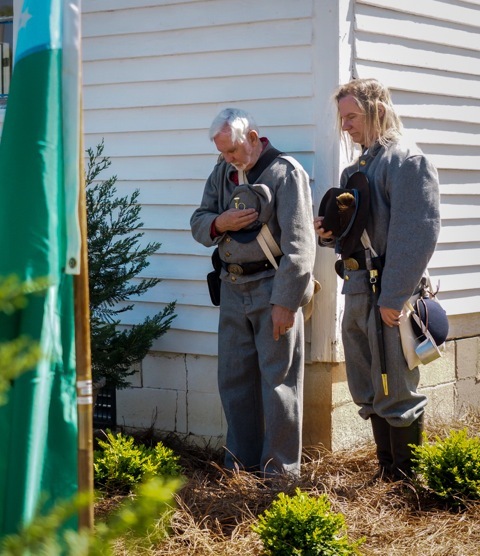 Bo Hill who is also commander of the local Sons of Confederate Veterans. 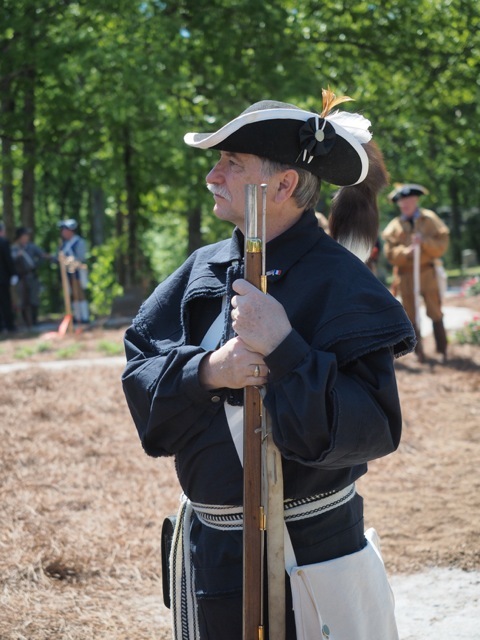 French volunteers were key to U S independence. 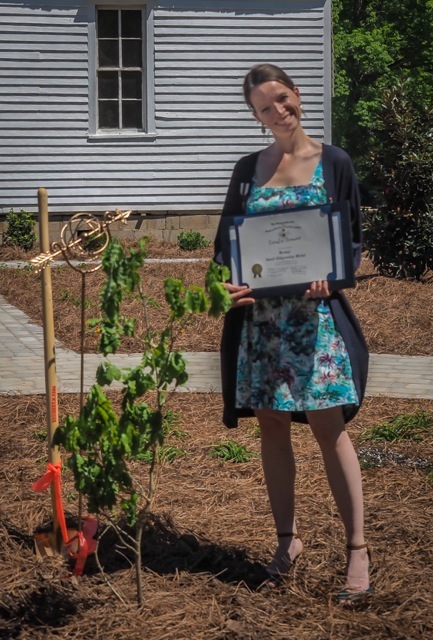 Seedling from the “Marie Antoinette Tree”, delivered by a curator of the Palace of Versailles. 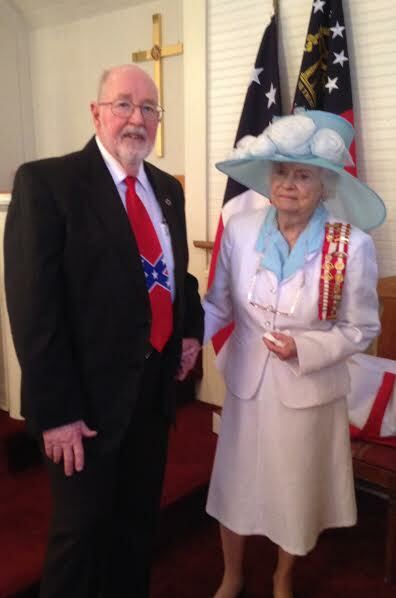 April 26, 2015 Circuit Ridin Preacher with Mrs. Iris Lee Jordan whose Father was a Confederate Soldier. 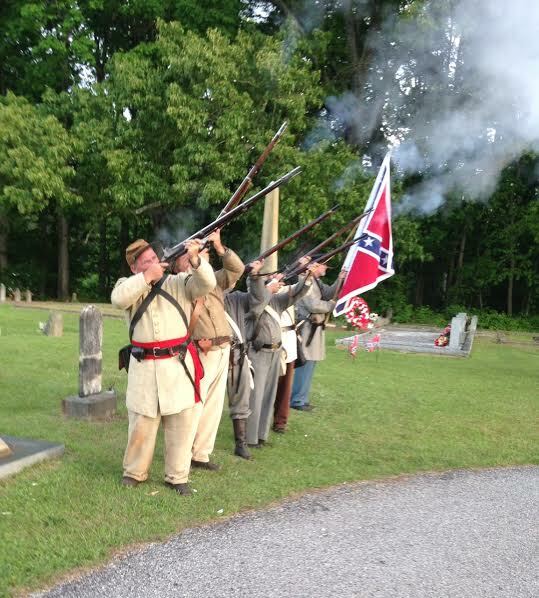 Musket volley salute at Fayetteville Cemetery where many Confederate soldiers are buried. I have a couple of books on my my mind this morning. One is by a dedicated missionary who served faithfully and fruitfully in China and Manchuria thru wars, famine, pestilence and the death of 5 children. I just re-read her little autobiographical book for the 2nd or 3rd time… How I Know God Answers Prayer is the moving story of determined dedication to duty and patient persistent patience in persecution – Rosalind Goforth. The other Book is The Book – or at least one of my copies of The Book. It is an old, raged hardback copy with that well-known symbol in the lower right hand corner “Placed by the Gideons”. We had one of their men speak in our church this past Lord’s Day and I shared with him about my favorite “Gideon Bible”. Though they do not like us to call it that. It a copy of the Bible placed by the Gideons. And on that page is a photo of me from 1985 with Mr. & Mrs. J. M. Hargett, the Gideon who placed that Bible in 1941. When he replaced it with a new one he says he kept this one to himself, determined to save it and present it to me when I started preaching. 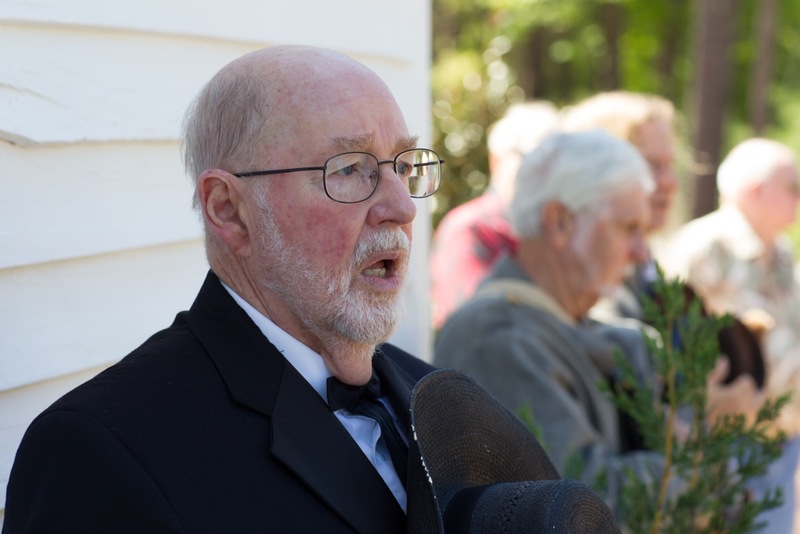 He told me “I knew that you were going to be a preacher and I wanted you to have it.” He was the long-time Sunday School Superintendent in our Wynnton Baptist Church and I had just finished the first grade. My only regret is that she did not ask that for all of her Grandsons! Posted on April 17, 2015 by Dun Gordy.